There is no doubt that the attention now paid to plastic pollution is greater than it has been for decades. With the government considering raising the 5p plastic bag charge to 10p, as well as the potential ban on straws and cotton buds, there is no doubt that curbing the amount of plastic in the environment is high on the agenda. Public awareness has risen too, but while the government has made the right noises with regards to banning harmful consumer products, cuts to council services over the past five years have seen household recycling rates decline over the country. Some organisations have a bigger task when it comes to eco-friendly practices. While every office could probably always do more to keep it green, such as more vigilant recycling and less printing, laboratories face considerably more hurdles than the typical office. Energy-intensive equipment, hazardous chemicals and, of course, huge amounts of plastic waste all work against any lab’s chances of being environmentally friendly. So how do you run a greener lab? We look at some of the challenges lab managers and staff face, and how to overcome them. The equipment used in most laboratories consumes vast amounts of energy. The majority, such as incubators, freezers and fridges, are constantly switched on. Fume hoods, water baths and centrifuges are also very energy-intensive, and these are instruments which almost every lab will use. Consolidating equipment can be one of the most effective ways of reducing energy consumption. For example, many biological samples need to be stored in ultra-low temperature -80°C freezers, but often samples which are no longer needed are left at the back rather than being disposed of. By removing redundant samples, labs with multiple freezers may be able to consolidate to one or two. Seeing as each -80°C freezer can use as much energy as an entire family home, daily, these actions can make a huge difference. Such large pieces of equipment are expensive to purchase, but old, inefficient models can cost labs even more to run. Rather than waiting until an instrument gives up the ghost, conduct audits to establish whether your ancient water bath is using more energy than it needs to. Many vendors offer swap-in services for older models, with discount schemes for part-exchanges to minimize capital expenditure. Additionally, the extra heat generated by lab equipment can throw off air conditioning systems, which may use additional energy to overcome this. The fact that lab staff don’t tend to keep ‘normal’ 9-5 hours contributes to increased energy consumption. Researchers have their own schedules and therefore, lights and equipment tend to run for longer than the standard office or family home. Labs could install motion sensor lighting, or timers so equipment not in use switches off at night. The use of chemicals in most labs is unavoidable. However, by researching greener alternatives, or refining protocols so less of the hazardous substance is required, labs can minimise their environmental impact. For example, the commonly used DNA gel dye ethidium bromide is a mutagen, and is therefore hazardous both to people and the environment. There are a number of commercially available greener alternatives, but the cost of such chemicals is often a barrier to their use. Labs can be vast places, and it’s hard to keep track of which chemicals you have in which storage rooms. Keeping an accurate inventory prevents doubling up on chemicals when ordered, therefore reducing the amount that goes to waste. All laboratories depend on single-use plastics. While the government is putting pressure on businesses to cut down this type of material (for example, coffee shops now offer discounts to customers using re-usable coffee cups), life science labs in particular require sterile conditions, which are conveniently achieved with single-use products. 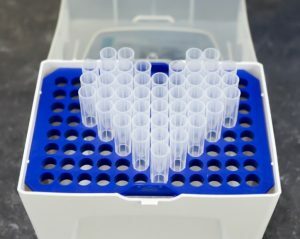 Labs get through hundreds of pipette tips per day, with larger facilities throwing them away in their hundreds of thousands. Plastic gloves, petri dishes, centrifuge and PCR tubes and all the packaging that these items are contained in, all end up either in landfill, or, if hazardous, in the incinerator. Autoclaves are very useful for sterilizing glass, liquids and biohazardous material, but unfortunately cannot be used for most plastics. It was estimated that bioscience labs alone threw away around 5.5 million metric tonnes of plastic across the globe in 2014. Reviewing protocols and using glass rather than plastic, where possible, or making purchasing decisions based on a product’s recyclability/ease of sterilising, will encourage vendors to produce more environmentally friendly lab products. Some vendors now enable filters so customers can search for ‘green products’ on their websites, to make this even easier. How can we incite change? Turning a green hand to laboratory plastic is everyone’s responsibility, from undergrad students to grant agencies. Universities run a large proportion of laboratories worldwide, and have the potential to be a big voice for change. By offering incentives for reduced plastic use and only choosing green suppliers, other institutions might follow suit. Agencies could make more eco-friendly lab practices a requirement in grant applications, or fund safe lab recycling facilities. Read one testimonial from researcher Nidhi Sharma, Stanford University, who endeavoured to cut her plastic waste with a number of simple steps. Here at The Scott Partnership, we work with a number of instrument vendors and their customers, such as research labs, to communicate the great work they are doing. If you would like to find out more, please get in touch.